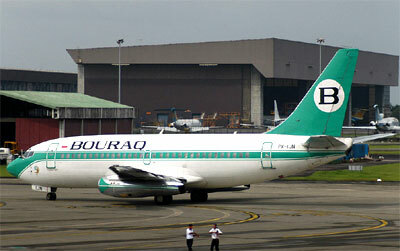 Bouraq Indonesia Airlines used to be an Indonesian airline carrier based in Jakarta and wholly owned by the Sumendap family. The airline company used to operate scheduled international and domestic flight services from its bases in Surabaya Airport and Soekarno-Hatta International Airport in Jakarta. The flight carrier has a secondary hub located at Sepinggan International Airport, Balikpapan. International destinations include cities in Singapore, Brunei and the Philippines. Bouraq Airlines started in 1970 but ceased all its flight operations and services in July 2005 and terminated all its staff by 2006 due to financial crisis and failure to search for investors.